The momentum within online gaming communities to organise help and donations for the Hurricane Katrina relief effort is gathering pace. Virtual worlds Second Life and There are using their community and technology to let players donate funds from within the games. In Second Life, a virtual memorial has been created, where residents have been donating and placing virtual candles. The companies behind There have also pledged to match gamers' contributions. "In support of these Community efforts and in response to this disaster, Makena Technologies, together with The Maya Foundation, will match the Community's contribution up to $50,000," a statement on the website read. In Second Life and There, players or residents build the neighbourhoods and virtual structures within. They work in a similar way to the Sims games. Both games are more like physical worlds which focus on social interaction over gameplay. One Second Life resident called ReallyRick Metropolitan constructed the computer generated memorial for those who perished. Within hours, virtual candles were constructed and placed around it, as well as other virtual tributes. A clickable sign in the game takes residents to a Yahoo page where they can donate directly to the Red Cross. A contribution system to turn Linden Dollars, Second Life's virtual currency which players use to trade in virtual goods, into to dollars is also being developed. It lets residents directly contribute their in-world currency to the relief effort, according to one of the Second Life official bloggers. Residents can pay Linden dollars (L$) from their accounts to a donation box. The resident who owns the box converts the funds to "real-world" money and sends that to the American Red Cross. "As with any act of charity, therefore, donating is an act of trust," said Second Life blogger, Wagner James Au. The Second Life residents have collected at least $3,300 (£1,793) in "real-world" money. They have also been holding in-world events, such as raffles, virtual item auctions, dance parties, casino-style game sessions, and live radio DJ telethons to raise L$, according to Wagner James Au. "The fact that people in Second Life interact [as] avatars seems to make them more generous, more compassionate," he told the BBC News website. "Perhaps because being together in an online world gives them the distance and abstraction not to be overwhelmed by the true horror of the event, while still feeling that connection, and that desire to connect, with others who are similarly galvanized by the tragedy." 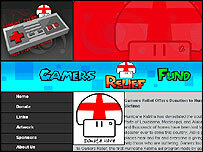 A dedicated aid programme for gamers, called Gamers Relief, has also launched a website to collect funds from gamers who want to help. Its aim is "to rouse the gaming community and provide a means for them to aid those struck by the worst natural disaster in the history of the US." "Usually gamers get a bad rap, especially in the US," co-founder Casey Ayers told the BBC News website. "There has been lots of legislation lately that has blamed video games for violence. So this is a great opportunity for game lovers and the industry as whole to help people in need." The site is run by a network of volunteers within the gaming community which runs the Advance Media Network (AMN), a website community dedicated to video gaming news. "We ask that gamers do without just one game, accessory, or console that was on their shopping lists and put this money toward the greatest cause of all - hope," a message on the Gamers Relief website reads. The site, which went live on Monday, also hopes it can whip up some momentum from bigger media sites. "Large sites are getting on board. We ask that anyone with a site or any form of media outlet places the Gamers Relief logo on their site with a link to donate," co-founder Sean O'Neill from AMN told the BBC News website. "We have also been in talks with game publishers and developers who are looking to help. It's been incredible, and it's just the start." Some people may be wary of contributing to a pool of funds, via the secure Paypal online payment system, that then gets forwarded to the American Red Cross. But Mr O'Neil and Mr Ayers stressed that 100% of the funds would be going directly to the American Red Cross. "We have seen many people exploiting services like this," said Mr O'Neil. "I want to make it clear we are giving all the funds to the Red Cross. "We will be providing the paperwork to show this at the end of each week to any press or media outlets who request it. "This was the fastest way we could set up such a fund. On top of that many of the larger companies who are looking to get involved are asking for follow-ups in terms of a paper trail which we are happy to provide. "We are working to find better ways to tackle this issue in the future." Last week, Sony Online Entertainment, which is behind the hugely popular Everquest II massively multiplayer online game, said it had introduced an in-game donation command line. By typing in a /donate command, players are automatically taken to the American Red Cross's Hurricane 2005 relief page where they can donate.